Helen Bowman and Nicola Whalen, of Bright Futures in South Shields. 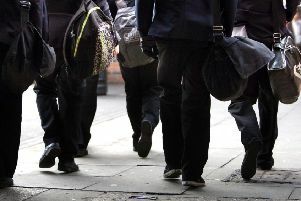 Two projects in South Tyneside which help young people get into work are set to get a share £90,000. The Virgin Money Foundation has announced a new round of grants from its North East Fund, awarding £382,109 to benefit charities across the region. Ten different charities from across the North East will benefit from the new grants, with funding to support a variety of different projects, many of which are focused on generating youth employment. The organisations receiving funding in South Shields are Action Station, South Tyneside, which will be given £38,718, and Bright Futures which will get £49,969. Both organisations help people get into work, although Bright Futures aims specifically to help women who have experienced sexual exploitation. Helen Bowman, Managing Director, Bright Futures said: “We would like to thank the Virgin Money Foundation for their continued support to Bright Futures, providing us with a grant to help us to provide intensive support to young women between the ages of 16-25 across South Tyneside to help them into sustained employment. “Not only does the Foundation provide grant funding but we have also benefited greatly through the extra ongoing support that is available to organisations. Hazel McCallion, chief executive, Action Station, South Tyneside said: “We are extremely grateful for the support provided by Virgin Money Foundation and the grant will be used to support young adults into sustainable employment. The latest grants bring the total level of awards made by The Virgin Money Foundation to over £6.8million since it launched in August 2015. The Virgin Money Foundation offers additional support to charities beyond grant awards. Each successful charity will also be able to take advantage of pro-bono support, training or mentoring from colleagues at Virgin Money. Charities benefit from the expertise that this opportunity presents, as it enables them to fill skills gaps they may have in a particular area.